This is part 3 in a series comparing Amazon leadership principles with Scripture. 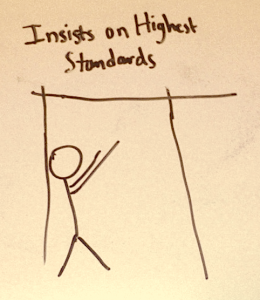 Today’s post is about Are Right, A Lot, Hire and Develop the Best, and Insists on Highest Standards. The previous post was about Ownership; Invent and Simplify and you can see the full list here. Yes, the freedom to make mistakes is necessary to grow and learn. However, when leaders are wrong a lot, their mission will fail and the team will fall apart. How does a leader demonstrate humility while being right a lot? We discussed Amazon’s other leadership principles like Invent and Simplify and Vocally Self-Critical which require a leader to be open to ideas from any where and to forthrightly admit their own mistakes and failures. And of course Jesus is our example of a man who was always right and thoroughly humble (though we did not dive deep into his life). We know he did not want his disciples to be naïve, telling them, “I am sending you out like sheep among wolves. Therefore be as shrewd as snakes and as innocent as doves.” (Matthew 10:16). However, being right a lot is not enough, as we see in examples like Ahithophel who was so smart his word was treated like the Word of God, but who died in ignominy (he ended his own life when his advice was not followed) (2 Samuel 16:15-17:23). It seems that “being right a lot” is always in the service of love, as taught by the apostle Paul in 1 Corinthians 8. He affirmed that the believers who thought all food was acceptable since it was all from God were right, but that their knowledge should not be used to harm other believers by causing them to violate their consciences. Believers in the right should lovingly forgo their own claims to rightness in order to build up their brothers and sisters who were wrong on the matter. We noted that as illustrated by the Proverbs above, it’s normal to look for the best and avoid the worst. Leaders always look for top talent and give them opportunities to grow. They don’t hold people back, but use their influence to maximize the potential of those under their care. It doesn’t mean that Amazon only hires people who have already arrived at eminence in their field, but it does mean that Amazon invests in the people that have the potential to develop into those top performers. What are the limits to this principle? It is possible to set too high of a bar so that you can hire no one. Unrealistic expectations can also be frustrating for the people who have already been hired. However when an organization fails to practice this principle, it can stagnate or degenerate in the worst case and the best people will want to leave and go elsewhere. How does this relate to Scripture? The notion of developing people, seems very much in line with Jesus’ commandment to make disciples, teaching them to obey everything he commanded (Matthew 28:18-20) and also with Paul’s words to Timothy: “And the things you have heard me say in the presence of many witnesses entrust to reliable people who will also be qualified to teach others.” (2 Timothy 2:2). We can see his list of elder qualifications to get an idea for who Paul would have considered “the best”. We had a lengthy, but inconclusive discussion about the differences between God’s kingdom and the corporate world and whether or not the principle of developing virtuous, happy people from “the best” and “the worst” as the measure of true wealth might be a unified endeavor. Leave a comment if you want to know more about this since it was a hot topic, but I can’t summarize it well for this post. How do you balance Insists on Highest Standards with Delivers Results? We had a very engaging, but rambling discussion on this topic, which makes it hard for me to summarize. This is nothing new, but it firmed up my convictions about quality. So in the future I’d like to try to do this: We don’t want to sacrifice quality, since it is bad for customers and it is bad for developers. We should very very carefully pick the features that do get built since few things are worse than wasted labor and unused products (inventory). Thus, when making tradeoffs, we should always cut features instead of cutting quality or completeness of the features that have already been chosen. We should also set aside time for experimentation, learning, and exploration where the quality of the learning is the aim (the product quality is irrelevant in this case). How ought we as Christians and Amazonians treat those who are not right a lot, who are not considered the best, and who do not meet the highest standards? Leave a comment and come back tomorrow for the next post on Think Big, Bias for Action and Frugality. Thank you for these posts as I do my research on Amazon. The more impressive part from finding this article is that you found a group of Christians at the work place, something I am looking to have at my current place. You’re welcome! Where are you now?